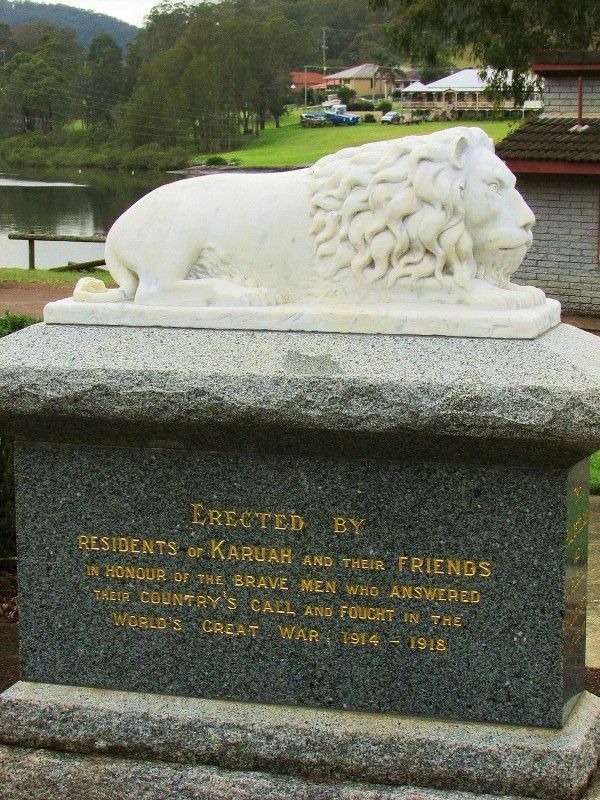 Karuah War Memorial was erected by the residents of Karuah and their friends in honour of those who served in World War One. 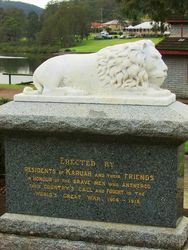 The monument is a sculptured figure of a lion on a granite base. Some time ago Mrs W. Longworth, of ''Glenroy," took in hand the task of raising funds for the erection of an Honor Roll to perpetuate the memory of the soldiers who left that district to fight in the great war, and on Saturday last, the success of her efforts was crowned by the unveiling of a beautiful memorial, erected on the reserve overlooking the river and bay, at that charming locality. The Roll of Honor comprises a solid block of granite, mounted on concrete foundations, and surmounted by a recumbent lion. 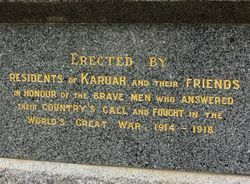 Mrs Longworth, in unveiling the Roll of Honor, in an eloquent address, paid a high tribute to the valor of the Australian soldiers, whose noble deeds would live as long as history was recorded, and she thanked the local committee and others who had labored to have the memorial erected. The memorial was erected by the firm of Meldrum and Markey, Newcastle, and the hon. secretary to the movement Miss Hagan, of Karuah. WORLD`S GREAT WAR 1914 - 1918. Down His Life For His Friends.